This best selling text has been completely revised and refreshed in the fourth edition. The authors aim to enthuse family doctors (for whom they are primarily writing) to enjoy the challenge of diagnosing and treating skin conditions. 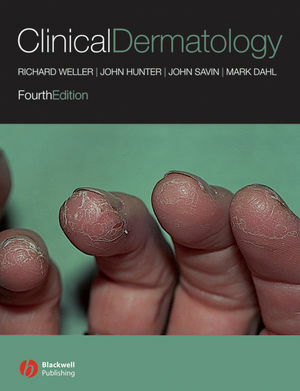 Clinical Dermatology contains over 500 high quality pictures and diagrams matched with many colourful phrases to illustrate and entertain as it teaches. It has established a reputation as a ‘way of learning’ and as a cogent overview of the subject for the aspiring specialist. Readers are guided through the maze that too often lies between the presenting skin complaint and its final diagnosis and treatment. The authors have created an easily read text with enough detail to clarify the subject but not enough to obscure it. Richard Weller, Consultant Dermatologist, University of Edinburgh, UK. John AA Hunter, Consultant Dermatologist, University of Edinburgh, UK. John Savin, Consultant Dermatologist, University of Edinburgh, UK. Mark Dahl, Professor and Chairman of Dermatology, The Mayo Clinic, USA. 1 Skin disease in perspective. 2 The function and structure of the skin. 3 Diagnosis of skin disorders. 8 Reactive erythemas and vasculitis. 11 Disorders of blood vessels and lymphatics. 12 Sebaceous and sweat gland disorders. 15 Dermatology of different age groups. 18 Skin reactions to light. 21 The skin in systemic disease. 23 The skin and the psyche. 26 Medical treatment of skin disease. 27 Physical forms of treatment.